Farm equipment, supplies, and resources. As pastured based farmers - we get quite a few visitors from customers and other farmers a like. Many of times we sat down to put together "The List" of where we buy our equipment and supplies. We do a lot of prototyping on our farm and we have a very transparent-open-source approach to what we do. We WANT more farmers to be successful because we believe strongly the more that joins our ranks the larger and more diversified the market for our collective products will become. With that in mind it is in our interest to share our successes with others so you can avoid learning curves where avoidable. I have decided to make this one LONG rambling page of information. Below are the categories covered so just sit back and scroll. APPPA - American Pastured Poultry Producers Association - This is our number one go to resource for questions and answers from fellow pastured poultry farmers. There is no question, if you have poultry and intend to make a business of it this is the first stop on your list. They have a great online resource and community for questions and answers from some of the most experienced farmers in the field. NMPAN - Niche Meat Processors Assistance Network - NMPAN is a network and info hub for people and organizations who want small meat processors to thrive. We offer tools and information for small processors and the farmers, marketers, and meat buyers who depend on them. This is a topic of constant learning, relearning, and confusion. We have multiple agencies we interface with in Florida when it comes to food sales. There is the USDA, FSIS (under the USDA), FDACS (Florida Department of Agriculture and Food Services), and so on. There are many levels of permits for poultry production and many different methods of selling your non-poultry meat products. FDACS - Florida Department of Agriculture and Consumer Services - FDACS normally issues permits relating both to poultry and food establishments such as the PL90-492 poultry exemption and other food vending permits. CUSTOM EXEMPT REVIEW PROCESS - FSIS 5930.1 Revision 4 - This is the FSIS Directive regarding custom exempt processors. These are custom butchers where you bring pre-sold live animals to be butchered by the animal share be it full, half, quarter, eights, sixteenth, etc. and provided to the end customer. It should be understood, that these products can not be sold as pet food, animal feed, or retail cuts. Cornerstone - Pluckers, scalders, tables, knives, aprons, etc. Featherman - Featherman pluckers, scalders, killing cones, etc. We are beginning to use a significant amount of greenhouse building materials for our pastured shelters. The applications of inexpensive hoop structures can not be understated. All you need is a hoop bender of the correct size (10' feet through 20+feet) and a source of chain link fence top rail pipe (1 3/8" galvanized pipe). Colorado Metal Works - This is a source of various size hoop benders and related greenhouse equipment. Build My own Green House - This is another source we have used for greenhouse hoop benders and other various items. Chain Link Fittings - A lot of our original tractor hoop designs required quite a bit of welding until we discovered the many fittings available for chain link fence and greenhouse hoop structures. Quite a bit of the fittings we use in our pasture pen designs comes from this source in particular. Items used in our pen designs are as follows: tension straps, end rail clamps (you can use these everywhere), cross connectors (purlin straps), gate corners, hinges, etc..
Atlas Greenhouse - Located in South Georgia, This is a source of greenhouse supplies from fittings, to plastic, shade cloth and raw materials such as pipe/tubing both square and round. Imperial Builders & Supply - Located in central Florida, this is a source of greenhouse supplies from fittings, to plastic, shade cloth and raw materials such as pipe/tubing both square and round. DP Company, Inc. - This is our go to for tarps, straps, bungees, and anything a long those lines. They have nice heavy white tarps that are perfect for our small pastured shelters that last multiple seasons and far better prices and quality than retail stores. Building hoop structures is extremely easy, cost effective, and time efficient with a core design that is easy to modify based on your needs. We have fallen in love with using hoop structures and believe this will become a huge asset to pastured farmers in general. Uses for these structures are limitless from pastured chicken structures, feed storage, hay storage, animal shelters, etc. Below are a few DIY resources we have used to learn how to use this simple method of construction. As explained above we are utilizing hoop structures as we prototype more and more uses. We are open source in our designs and only ask you share with us any improvements you make so we can benefit from the knowledge sharing. For farms growing less than 3,000 birds a year a pen of this size would serve well since it can be moved without equipment. The hoop structure will bear a significant amount of weight allowing you to hang waterers, feeders and other equipment if need be. This of course makes moving the cages less difficult since everything is attached. Our kids (ages 8, 10, and 12) are able to move these cages without issue. This design is a no weld design and primarily uses chain link and green house fittings to construct. Hoops and base construction is using 1 3/8" galvanized tubing (top rail used in chain link fencing). 1 3/8" Top rail is extremely common and can be purchased at most hardware stores in either 21' or 10' long pieces. For the purpose of this design you will want to use 21' pieces for your hoops (each side of the hoop is 11' and you will need both male and female ends of top rail to come together at the peak of the hoop. 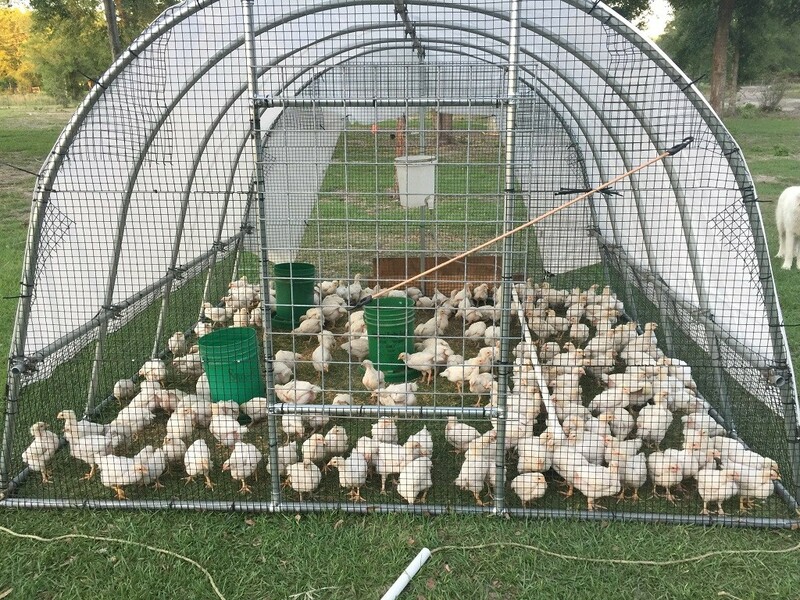 "10' x 10' Pastured Hoop Pen Design (no welding)"
For farms growing more than 2,000 birds a year cages of this design makes sense. They help reduce manpower on daily moves and have single structures for timed harvest versus multiple structures. Since the design is flexible it would be easy to make this pen 14 x 24 or 14 x 32 allowing anywhere from 250 to 325 broilers per pen. When we consider pen size we like to consider the maximum number of birds you can harvest in a single day. If that number is 200 to 300 for an example this size makes sense simply for easy of harvest from a single pastured structure. There are many other larger designs out there which would hold up to 600 broilers at a time but my thought is that only makes sense if you can harvest that many birds in a single processing session. Additionally, larger pens are that are wider than 14ft would potentially require the modification of gates going between paddocks in order to move them about your pastures. 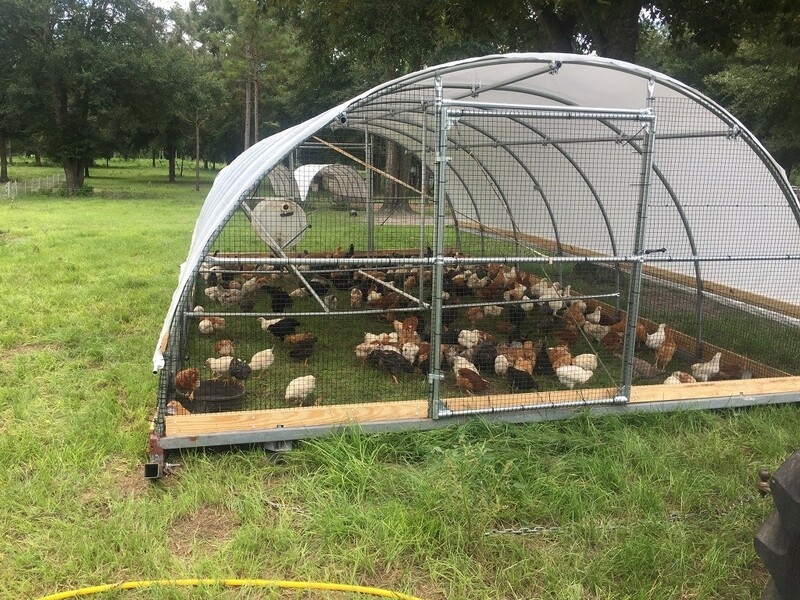 These shelters are also built with 1 3/8" top rail for hoops and the upper portion of the structure with a base constructed out of 2 1/2" square galvanized tubing. The 1 3/8" top rail can be found at most hardware stores, however, the base material typically will need to come from a metal supplier, green house supply, or something along those lines. Size: 14’x24’x7’. This size shelter fits through most pasture gates, but it’s also shorter so that it fits under low hanging branches as it moves through the pasture. Base: The base is comprised of 2-1/2” tube stock in 8’ sections so that it’s a rigid, flexible, and modular skid. A key part of the design of this shelter is that the base (skids and end pieces) are designed to be moved and they provide the structural rigidity of the shelter. The hoop that forms the roof, therefore, does not need to provide structural integrity to the base. It can be lighter and not as tall as the commercial greenhouse variants. We have been asked by many folks who visit our farm for a simple instruction on building our hanging hopper feeders. These are becoming the backbone feeder for the majority of our poultry needs. Its is a simple design that uses relatively readily accessible materials that can be built without too much difficulty or experience. I have put together an instructional under out Pasture Posts which can be found here: "Easy to Build Hanging Hopper Feeder"